With so many cooking shows on television these days, we’ve all seen professional chef’s chop and slice ingredients like a boss. 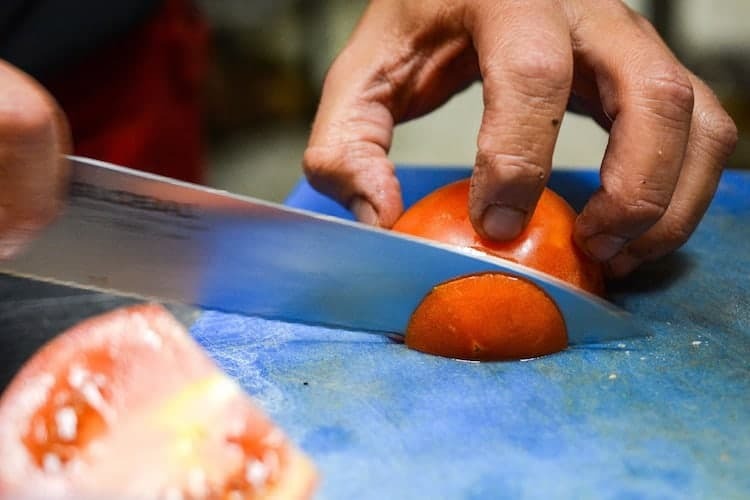 Whether it’s the rapid slice of a cucumber, or the fancy looking rock chop with that roll of the wrist; these chef’s clearly know how to handle their knives. 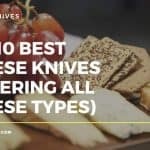 The fact is, learning how to use a knife properly will make some of those food preparation tasks a joy, rather than a chore. 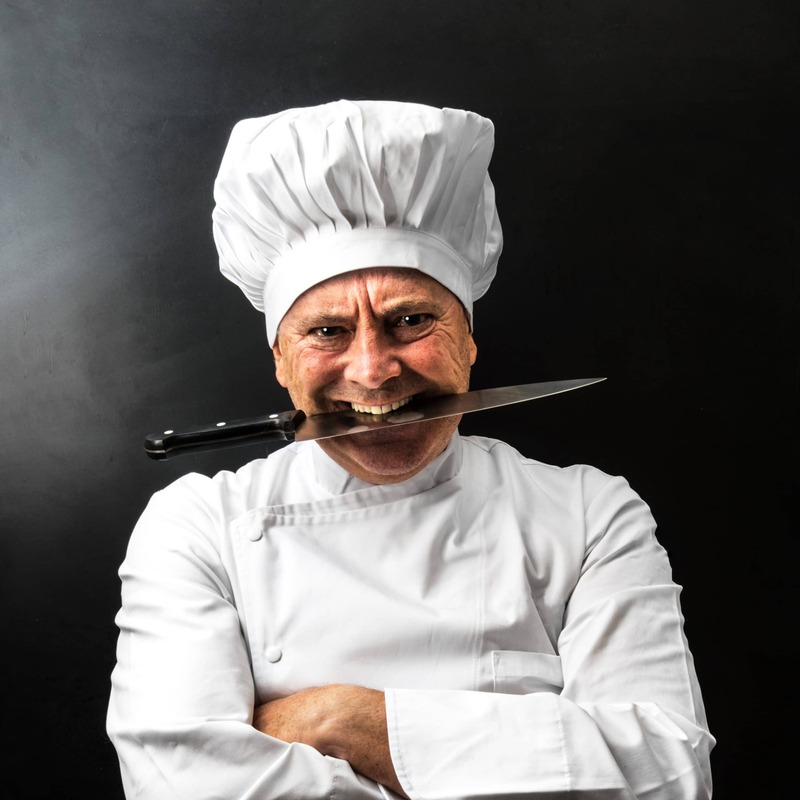 Furthermore, using a knife the correct way can mean the difference between unevenly cooked dishes with poor flavor development, and culinary perfection, (well nearly). 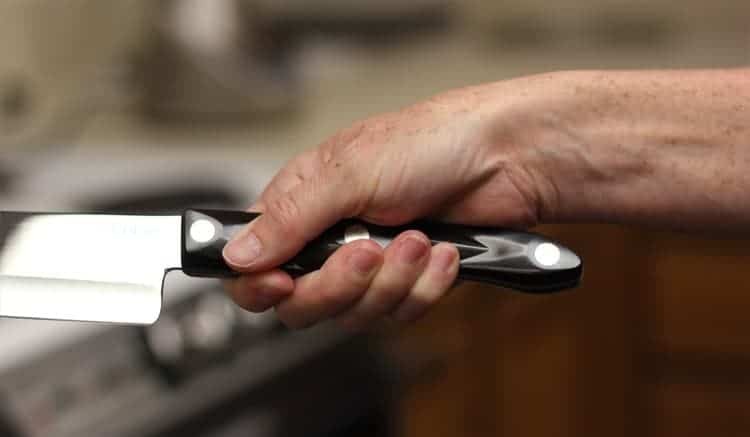 If you really are a total beginner when it comes to handling tools in the kitchen, you may need to know how to properly hold a knife, (if you get that bit wrong; the rest of our instructions will mean very little). It is no good trying to run before you can walk. 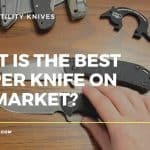 Before you start knocking those ingredients into shape with your chosen knife, you need to learn how to properly hold it. You also have to hold the knife a certain way for Mincing, and then there is the oft-used technique that you perform with your non knife hand called the Claw. However, as the saying goes, a picture is worth a thousand words – so we’ll let the images do most of the talking here. 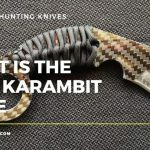 As you can see, when holding a knife with the handle grip, your hand is completely behind the bolster on the handle itself, (as the name would suggest). Beginner cooks will often use the handle grip as it offers greater steadiness. However, you will find you will have more limited control when doing precision knife work. More experienced cooks tend to use the blade grip. Here the thumb and forefinger rest in front of the bolster, directly onto the blade. This may seem counter-intuitive, (fingers on the blade? surely that can’t be safe? ), however cooks will utilise this grip as it provides greater balance and control. Your knife will have to have a bolster for the blade grip to work properly however. The claw is a particular favourite of mine, and offers exceptional stability when cutting ingredients. 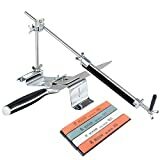 When using the claw, you are ensuring that foods are fixed firmly in front of the knife ready for cutting. You then simply guide the knife blade against the food with your free hand. 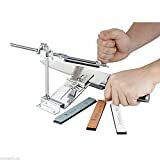 The finger tips are protected by the curled position, and your knuckles offer further guidance to the knife as you work. Knowing how to hold your kitchen knife while mincing in another important step to master. Here you need to place the tip of your knife on the cutting board and hold it in place with your free hand. The mince is all about the rocking motion with delicate control. Go steady to begin with, ensuring that you are cutting the ingredients into as small a pieces as possible. 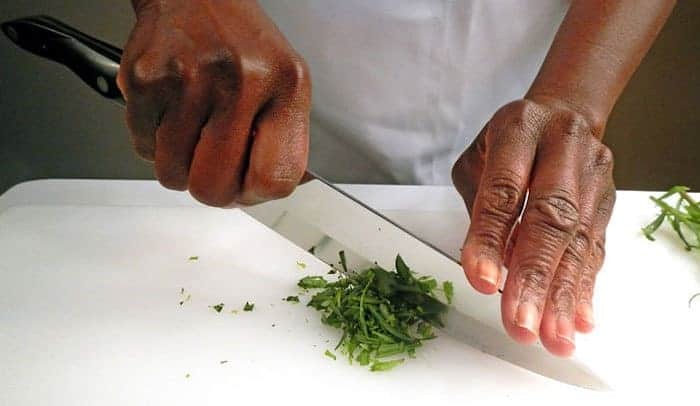 Now that you have mastered how to hold a chef’s knife, is time to move on to the knife strokes you will use to look like a boss in the kitchen. The slice is used on large vegetables and meats. It is also used to rough-slice herbs before mincing. First you need to shape the ingredient so that it can lay flat. This is normally done by simply cutting it in half, or cutting off a section. You then hold the food steady with your non-knife hand, using the claw. Hold the tip of the blade against the cutting board. The knife should be angled upwards, with the flat side resting against your knuckles. Now, here is the important part that many beginners fail to execute properly. Ensure that the tip of the blade is in constant contact with the cutting board. You then cut by pulling the knife backwards until the blade slices into the top of the ingredient. As this happens, apply further force by pressing downwards and forwards. The full length of the blade should then slice neatly through your food. Rinse and Repeat through the rest of your ingredient, while making sure that your blade tip is in constant contact with the board as you slice. The chop is used for precision cutting of vegetables and herbs. It is very similar to the slice in its purpose, however you will need a very sharp knife (Japanese style knives are generally preferred) to neatly chop through with out compromising the ingredients. As with the slice, the ingredient needs to rest flat and stable on your work surface. Do this by slicing it in half or cutting off a section. Again the claw is used. Hold the food steady with your non-knife hand, by curling into the claw and tucking your knuckles in. 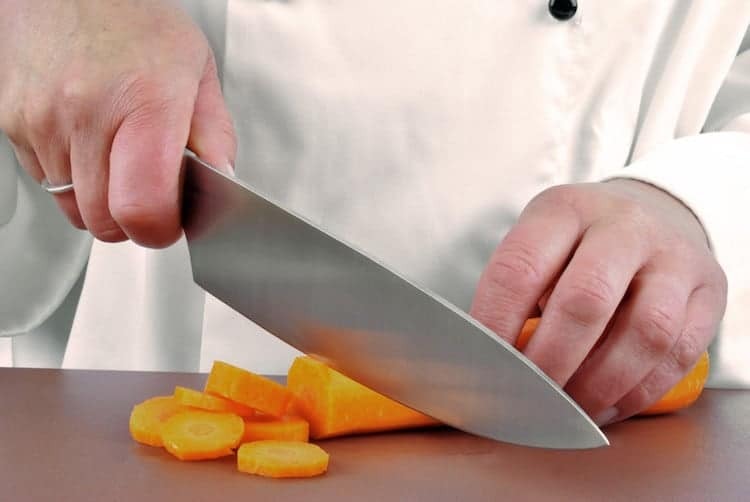 The flat side of the blade rests against your knuckles, and the entire knife length is lifted from the cutting board. Press downward in a smooth, even stroke, while shifting a little pressure forward as you go. Once you have made contact with the board, lift and repeat the cut through the ingredients until you are done. The back slice is used to create fine slices of small, delicate ingredients (think herbs and spices) without crushing them (so that they hold their flavours). When slicing herbs, you should stack the leaves together and roll them into a bundle. Then, while holding the grouped herbs together with your non-knife hand, curl your fingers into the claw. The tip of the knife blade in them pressed against the cutting board, with the flat of the blade resting onto the knuckles of your claw. You then pull backwards steadily with the knife held at a low angle. Use the entire length of the blade to slice through your food, using the backwards motion to execute the slice. Avoid any downward pressure. The slicing comes from the horizontal action of your blade. If pressure is exerted from above, you will crush your ingredients rather than slice. The rather catchy sounding Rock Chop, is used to finely mince fresh herbs and zests. 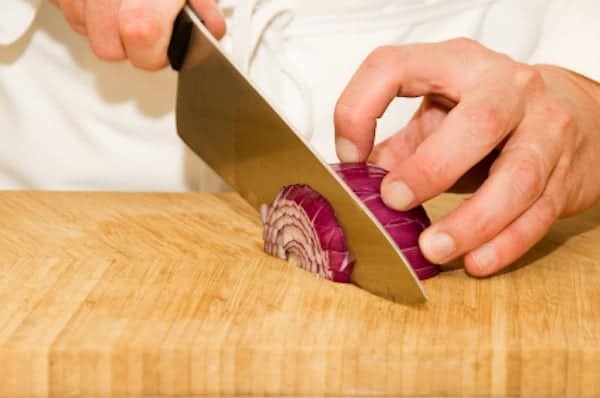 First you cut up your ingredients by either using the chop or the slice. Once in small bite-sized bits, you gather them into a small pile and begin the mincing process via the rock chop. With the tip of your knife to one side of the pile, rock the knife up and down, sweeping across your ingredients. When the ingredients begin to spread out across the chopping board, gather them up with your knife until they are in a pile again, and repeat the rock chopping action until everything is minced to your satisfaction. And there you have it, the 4 major knife strokes that every chef should know in the kitchen. 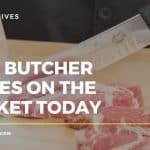 Just to make sure that you leave this article feeling like the next time you hold a chef’s knife you will know exactly what you are doing, below is a very helpful short video demonstrating how to use a knife like a chef.